Helen Sfikas Rogers has been recognized by professional peers with an AV Preeminent peer-review rating* through Martindale-Hubbell and inclusion in Mid South Super Lawyers each year from 2009 through 2018, among numerous other honors. In addition to arguing dozens of cases before Tennessee and U.S. appellate courts, she has lectured and published widely on a range of family law, estate law and other legal topics. 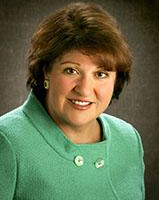 Ms. Rogers is a Rule 31 Certified Mediator and is also trained in collaborative law.